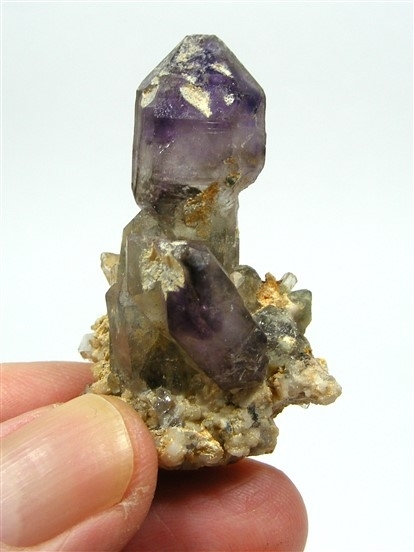 This is a superb high quality, Brandberg Amethyst Natural Point. 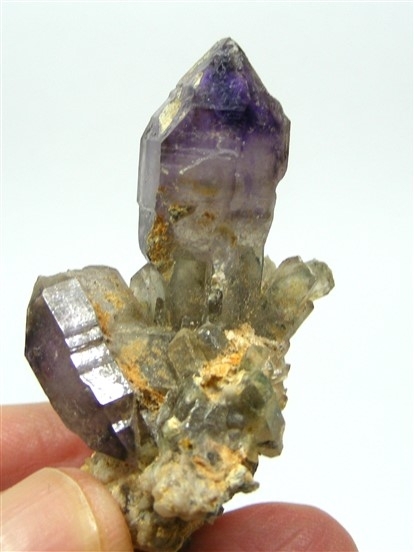 Often, just simply called Brandbergs, they are also known as Brandberg Quartz or Brandberg Amethyst and these points have many of the healing properties associated with Amethyst itself but seem to be of a higher vibration. They have a lovely, strong energy which makes them much sought after healing crystals. They are essentially a "blend", mostly of Amethyst but also with Smokey Quartz and Clear Quartz and, whether or not you can see all the three individual colours, their essence is carried by each crystal. They frequently display Amethyst phantoms and sometimes have bubbles of water in them too. They are found in the Brandberg mountain range in Namibia, hence the name. Brandbergs tend not to be "pretty" crystals and are frequently found with rougher or less smooth patches and lots of surface marks. 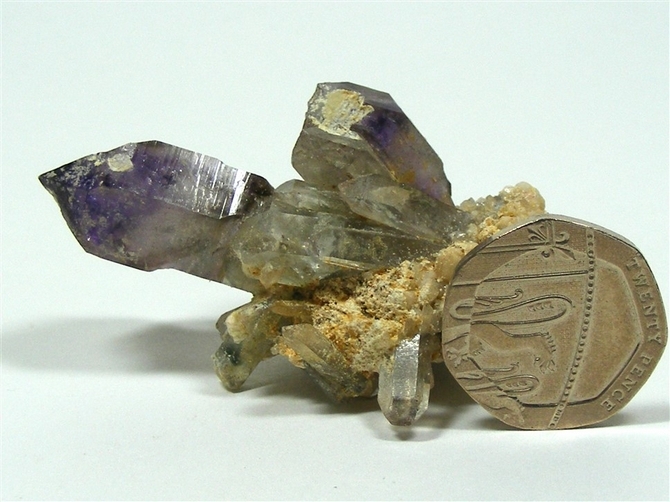 This particular crystal is a wonderful Amethyst Sceptre growing from a base of small Smokey/Clear Quartz. 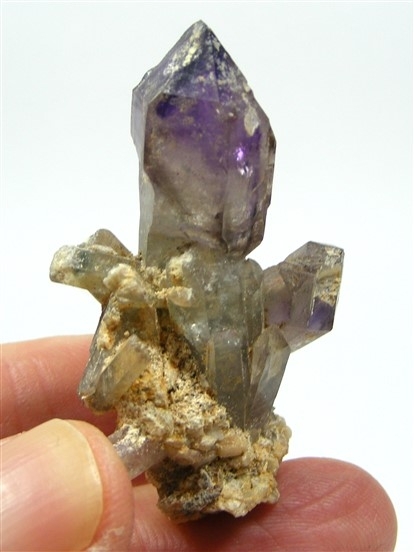 The sceptre is an unusual and complex formation in either Amethyst, Quartz or Smokey Quartz. This is a lovely crystal and it "sits" very nicely on a flat surface - always a nice to have ! Brandberg Amethyst is a superb crystal for soul retrieval, taking us back to the time when our soul was pure and before our family, friends, job and life in general all had a chance to leave their mark on us. Working with this crystal can help to restore our soul to a more perfect balanced state. 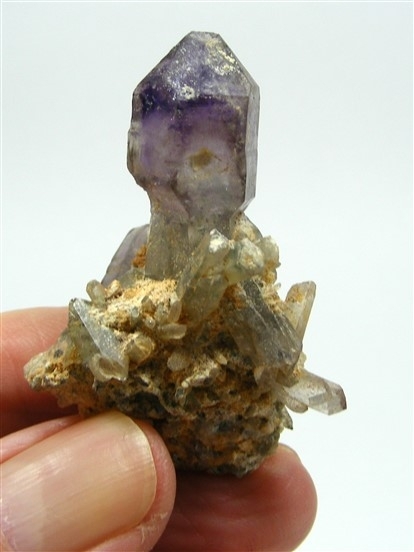 Brandberg Amethyst can be used on any chakra point to activate and realign our spiritual energies. They help us to grow in a more spiritual way and they also help to balance many aspects of our being.